The Center for Contemporary Printmaking in membership and juried exhibitions where her print “EarthMothers” won Honorable Mention. The Hallbrook Show in which she won Best in Show. Westport Historical Society: Mural depicting historical places of Westport. Westport’s Permanent Art Collection: watercolors “Gorham Island” and “Compo Beach”. 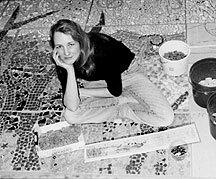 Longshore Pool: “The Kids’ Wall” conceived by Katherine, and with the help of Miggs Burroughs, involved the work of 1400 middle school students. It is currently the largest piece of public art in Westport’s history. Smithsonian Institute: co-designed and facilitated a mural for the United Nations featuring artwork by Staples High School students in response to 9/11. This mural has traveled internationally and will be permanently housed at the Smithsonian Institute. ​Corporate Logos: including album covers, Tibetan Archival Project, various company logos. Katherine has been teaching art for 18 years, privately and as an artist in residence at numerous schools, museums, and centers in the Northeast. She has classes for adults and children, specializing in portfolio development for college-bound high schools students. Katherine is involved in hands-on projects at the public schools. Many of these projects have become permanent works hanging in the halls of Long Lots Elementary, Bedford Middle, and Staples High School and at Longshore Park. Katherine is a member of the Arts Advisory Committee of Westport, and has been involved in the Westport Cultural Arts Committee, The Westport Art Center, The Rowayton Art Center, and the Center for Contemporary Printmaking. She has co-chaired the Art Smarts Program, which introduces painters and art knowledge to the children in public school and has served as the town representative for that program. Katherine has run workshops at The Katona Museum of Art and the Westport Art Center. She has taught at the Side By Side School in Norwalk and the Bridge Academy in Bridgeport.